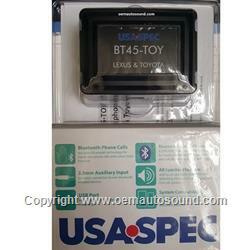 Lexus Toyota Bluetooth interface BT45-TOY allows the wireless connection between your OEM Toyota Radio and the Audio of a compatible Bluetooth enabled device equipped with A2DP audio streaming. In addition to the built-in Bluetooth technology, The BT45 also house an on board 3.5mm Auxiliary Audio input for use as a hardwired audio input option. 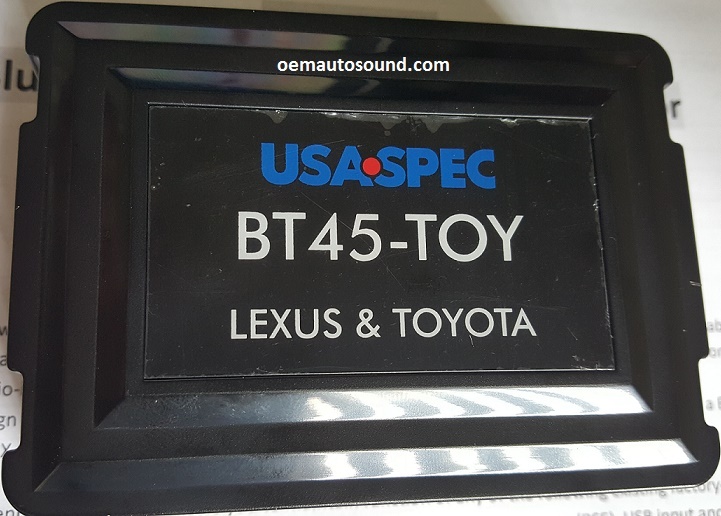 The BT45 simple design takes advantage of the Toyota Lexus radio's ability to accept Satellite radio and convert it into a Bluetooth audio streaming + AUX audio input source instead. 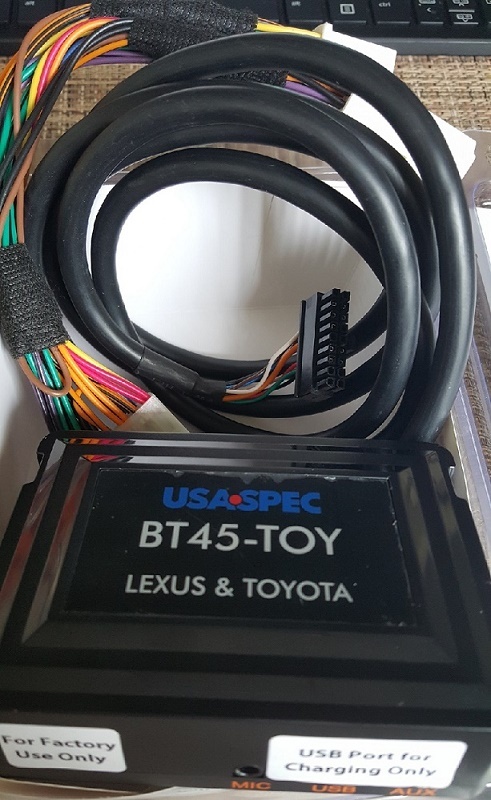 The Designed and ingenuity of the BT45 allows you to maintain function of any of the following existing factory installed options: Navigation, CD Changer, XM radio receiver, Rear seat Entertainment DVD system (RSE) USB input and even works in vehicles already equipped with factory BLUETOOTH systems. notes: The vehicle does not need to have any of the above options in order for the BT45 to work. The latest Bluetooth technology for hands free calls with smart mute function. 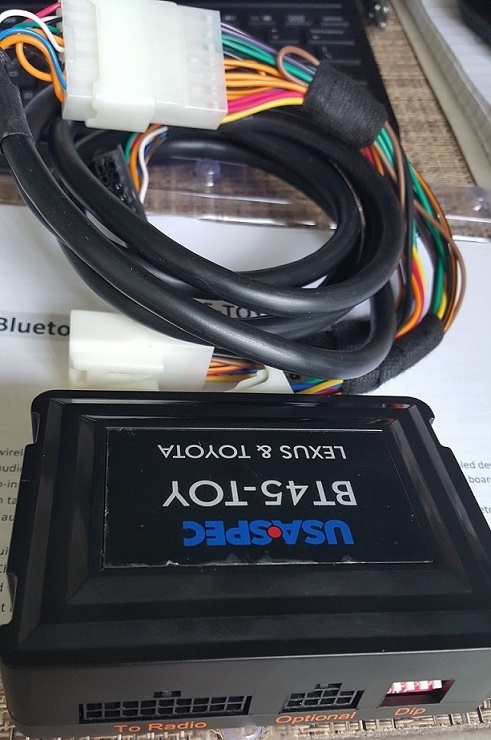 For wired connection to non Bluetooth enabled devices. Keep your devices charged and ready to go. and text display on supported radios. With balance audio output design delivering full and rich audio playback from all speakers. With Android, Apple, Windows, and Blackberry devices with appropriate Bluetooth profiles.